Thames Path National Trail at River Thameso1865 810224workWalking RouteThe Thames Path trail runs through the Richmond borough for 21 miles between Hampton Court and Barnes. Cycles are permitted on this stretch and share the path with pedestrians. The attractions en route include Hampton Court Palace; Hamlands nature reserve; Ham House and Gardens and Marble Hill House; Petersham Meadows and Old Deer Park in Richmond; Royal Botanic Gardens in Kew or Wetland Centre in Barnes. Along the way there are 6 bridges: Hampton Court, Kingston, Teddington (footbridge), Richmond, Kew and Chiswick, and 2 ferry services: Hammertons Ferry between northern bank near Marble Hill House in Twickenham and the southern bank near Ham House in Ham, and Hampton Ferry between the Bell Inn in Hampton and Hurst Park in Molesey. 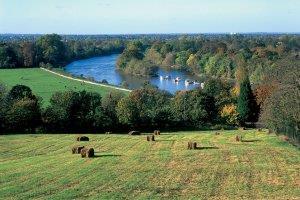 The Thames Path trail runs through the Richmond borough for 21 miles between Hampton Court and Barnes. Cycles are permitted on this stretch and share the path with pedestrians.